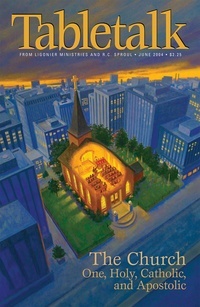 The June 2004 issue of Tabletalk examines the church by giving careful analysis of how it is defined as one, holy, catholic, and apostolic. Contributors include R.C. Sproul along with Edmund Clowney, George Grant, Kim Riddlebarger, John Sartelle, R.C. Sproul Jr., and William Webster. Tabletalk features articles about topics central to the Christian faith and daily, in-depth Bible studies.